Hey hey! So, I’m back! In this blog, I’ll be walking you through some great ways to use Reiki for self-healing. For those who don’t know me, I am Leila, Leila Hardy, I am your online intuitive Life and Business coach. I love nothing more than combining the power of your subconscious mind and energy to enable you to empower yourself to become the highest, healthiest, happiest version of yourself that you can be. As a woman, an ambitious empath, intuitive, holistic healer or therapist or spiritually based coach, I love to see you identify and clear any obstacles that are in your way of success, so you can be happy, healthy, wealthy and successful in anything you dream of doing or having, with the confidence to share your truth, own your unique power and believe in your abilties. What is Reiki? Well, if you are new to these blogs, you’ll find the answer to this question right here! You see, as humans, we are already wired to use our hands to heal ourselves. Just think of what most people do when they are stressed, or have a headache…they pop their hands on their forehead or rub their temples. When people have a stomach ache…they place their hands on their stomach area! You stub your toe…you rub it! We all do it unconsciously, without thought. The difference between doing that automatically, and using Reiki is that with the understanding of Reiki energy healing, you can interpret what you are feeling and activate additional healing energy specifically for what is going on in that area-so the healing becomes more powerful and more intentional, rather than instinctively rubbing and hoping for the best outcome! 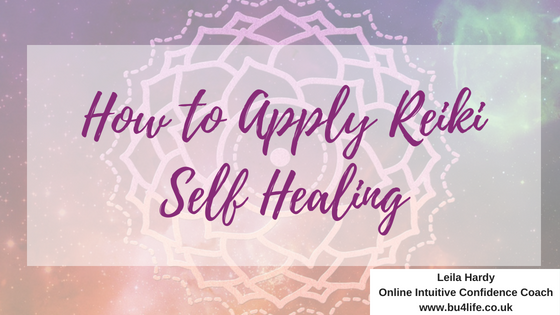 Here are a few ways you can apply Reiki self-healing in times of need, or on a regular basis! How can you apply Reiki self-healing? Pull a Reiki blanket around you as you go to bed. As you go to bed to sleep, activate all the Reiki symbols you have and allow them to go into each of your chakras, boring from the crown to the root chakra. Visualise each of the symbols lighting up inside of you, healing and clearing anything that no longer serves you, from the day gone by. As you do this, imagine a bright, white blanket of light being pulled over you, snuggling you in for the night for a great nights’ sleep, deep protection and healing while you go about the most magical part of your sleep. Apply the Many Hands Technique to multiple areas in need of healing at once. If you are experiencing multiple aches and pains, or are short on time for your Reiki healing routine, then the Many Hands Technique is a powerful self-healing session to apply with Reiki. Visualise your hands placed over all areas you want to work on and allow Reiki to flow to all those areas simultaneously. The full Many Hands Technique routine is demonstrated within my Reiki Level I & II course. Use the Reiki self-scan and healing each day as part of your daily self-care routine to prevent discomfort, worry, doubt, pain and illness, for example. Want the best tip of all when it comes to Reiki healing? Don’t wait until you need into use it! Prevention is always better than having to fix something once it is broken. Use Reiki daily in your life in the form of a self-scan and healing routine; it need only be 10-15 minutes. If you are a busy lady, like I am, then this is the perfect amount of time to support yourself to release any emotional, or mental blocks, ease physical discomfort and maintain your energy levels and wellbeing on a daily basis! When it comes to applying Reiki self-healing to your life, it is a powerful way to stay on track and energised throughout your life and work, it is a worthy investment of your time to master these techniques so that you can do and be everything that you want to, with confidence, ease and flow! Mastering all the Reiki techniques is key to implementing them in your life and helping others with Reiki with confidence. If you are already Reiki Level I & II attuned and would love to deepen your skills and intuition, then Advanced Reiki Techniques Training is for you! For more information about Advanced Reiki and what you will learn, click on the link here!